indicate "this is a good location for a Laundromat." be part of due diligence process. 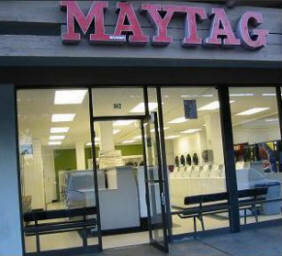 Success in a Laundromat is most often driven by three factors: population, exposure and parking. The acronym PEP has developed into the adage that "you need PEP to be successful in the Laundromat business." The demographic report is useful in looking at the first "P" in PEP. Maximum Southern California densities of people are up to 110,000 per a one mile radius in certain dense areas of Los Angeles County. As a general rule of thumb, a need for Laundromats is established when the population density exceeds 20,000 people in a one mile radius and increases up to an excellent area when the population exceeds 35,0000 in a one mile radius. Very few areas outside of Los Angeles County will have densities beyond 40,000 in a one mile radius. After you know the base number of people you want to know other factors as well. First, we would like to see a minimum of 25% renters with anything over 50% being excellent. Second, we would like to see Hispanic population being a minimum of 25% with anything over 50% being excellent. Third, we would like to see the neighborhood age as being over twenty years with anything over 30 years being excellent. Fourth, we would like to see blue collar workers at a minimum level of 35% with anything over 50% as excellent. A full demographic study will include a map of the area which will allow you to see if any obstacle interferes with access to your Laundromat location. Freeways, railroads, river beds and bridges are barriers that can block easy access to your location and reduce the effectiveness of marketing and drawing customers from your prime one mile radius. 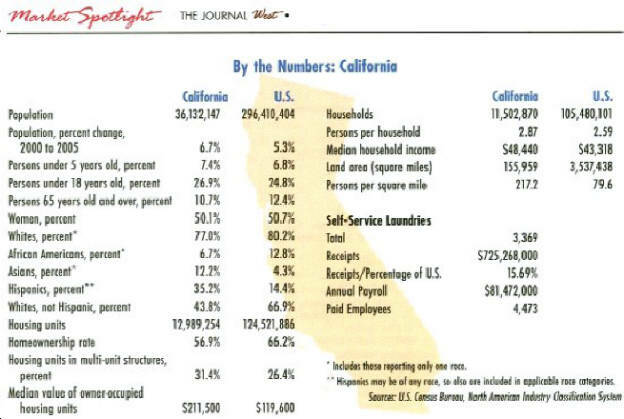 Below is a reprint from a publication of the Coin Laundry Association magazine showing the number of Laundromats in California. The numbers indicate that California has over 15% of the income of the nation and should therefore be an excellent place to locate your investment. A detailed analysis of a demographic report might make it easier to mine some of this "California Gold."